Case A. Former Atlanta Falcons star quarterback Michael Vick pleads guilty to operating a dogfighting ring. He is sentenced to 23 months in federal prison, of which he serves 18 before being released to home confinement. Upon his release he is reinstated to the NFL (after a two-year absence from the league) and picked up by the Philadelphia Eagles. 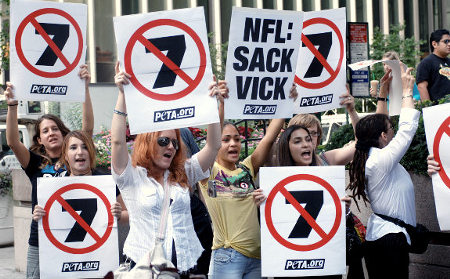 Eagles fans and fans around the country go crazy, objecting to the reinstatement. Throughout the ordeal there are high-profile protests by animal rights activists. Case B. Cleveland Browns wide receiver Donte Stallworth kills a 59-year-old construction worker while driving drunk. He is sentenced to 30 days in jail, of which he serves 24 before being released to home confinement. He will be reinstated to the NFL in 2010 (after a one-year absence from the league). There is very little high-profile public outrage around Stallworth’s case.